Join a mighty little mouse as he discovers he has the strength to face his foesand end up the Big Cheese in this rousing musical adventure your family will treasure. Featuring the voices of Ralph Macchio, Dom De Luise and Harvey Korman, this charming adventure is a wonderfully heroic tale that will make your family want to stand up and cheer! Welcome to beautiful Thorn Valley, where the mice-folk have everything they could possibly need — ¦except a hero. that’s why they call upon Timmy Brisby, the youngest son of Jonathan Brisby who once saved them from an evil place called NIMH. There’s only one problem Timmy’s a novice, so it’s necessary for him to go through hero training 101, but before he even has a chance to graduate, Timmy must put his new skills to the test. 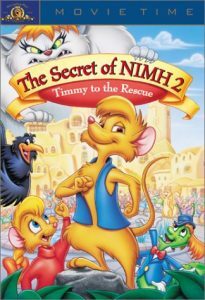 Taking on NIMH is a big job for a little guy, but Timmy is up to the challenge and before he’s through, he’s going to prove that no matter one’s size, anyone can be a hero.